Jessica Vasquez, Nataly Ibarra and Dulce Guerrero met through through their decision to speak out about their illegal status. The Department of Homeland Security announced plans this week to review 300,000 pending deportation cases in federal immigration courts to determine which individuals meet specific criteria for removal and to focus on "our highest priorities." That could be good news for some students who have been putting their illegal status out in the open in protests around the country. Such protests target immigration enforcement legislation or push for federal laws that would give illegal immigrants a path to become residents or citizens. One such protest took place in Atlanta earlier this year when seven students, all undocumented, sat in the middle of a major road and blocked traffic. "The civil disobedience we follow that from the civil rights movement," says Dulce Guerrero, 18, a recent high school graduate who ended up in a police van that day. Guerrero and her friend Nataly Ibarra, 16, were drawn together by their choice to speak out about their illegal status despite serious consequences, including deportation. "It is rhetorically powerful because undocumented immigrants are supposed to be in the shadows. An illegal alien is someone who isn't supposed to be around, so to say that you are coming out of the shadows means that you are flaunting the whole idea of being illegal of not belonging,” said Dr. David Cisneros, a communications professor at Boston’s Northeastern University. The Office of Homeland Security is signaling that it might be willing to give people like Ibarra a break by not prosecuting low priority cases. It's a move that could open the door for more illegal immigrants to come out. Two ad campaigns, two major underlying issues - racism and underage sexuality - had our readers arguing. 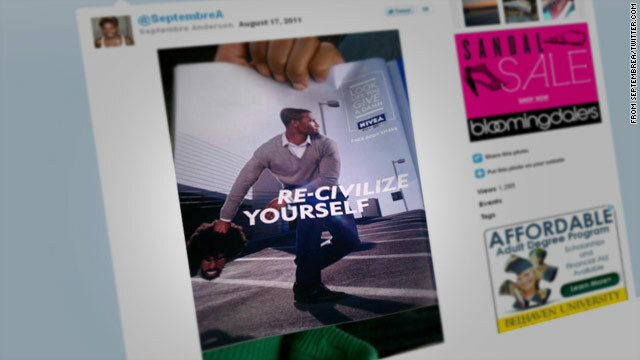 In one, Nivea for Men ran, and later retracted, an ad showing a well-groomed African-American man holding what was apparently a mask of an unkempt African-American man and the slogan "Look Like You Give a Damn. Re-civilize Yourself." The heat was so high on Twitter that Nivea almost immediately retracted the ad with an apology. Many commenters questioned whether the response would have been the same if a white man had been portrayed in the same way. In fact, there was one, which read "Sin City isn't an excuse to look like hell." Was it a racial portrayal of African-Americans? Readers who identified from both races spoke for both sides of the issue. S1N said, "Seriously, racial? I see a mask of a black guy that looks like crap next to another black guy who is well-dressed, well groomed, and looking sharp. It's obvious which one cares about his appearance. That's the point of the ad. Hate to break it to those of you who are easily offended, but people can look like crap in any color. They can also look presentable. Sorry, but the guy in the ad is much more likely to get promoted or get laid than someone who looks like that fugly mask." chef said, "Calling someone a 'black hole' isn't racist. Calling someone a 'tar baby' is. Referring to anyone black as 'uncivilized' could certainly, historically, be considered racially insensitive. However, would calling a young African-American street-level gang member 'uncivilized' be racist? Again this is a grey area, but I can't really think of too many black people who would be overly upset at this advertisement. I'm not black, but I do understand what it's like to be judged by racial stereotypes." Candy S asked, "What if the photo was of a white male who was clean-cut throwing out a 'mask' of long, long hair, maybe even in a pony tail? No one would say anything to that. The ad is to clean up your look and that is it." 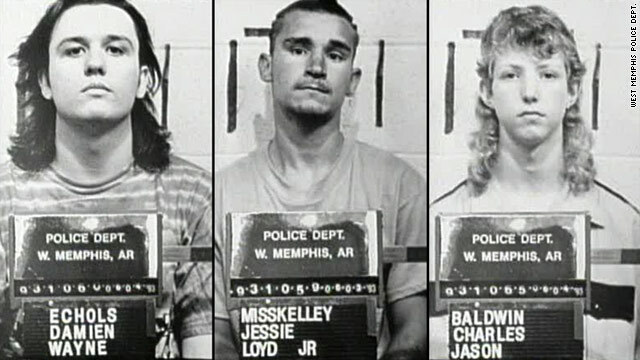 Three men convicted in the 1993 murders of three boys in West Memphis, Arkansas, were ordered released after entering new pleas following a court hearing. Damien Echols, Jessie Misskelley Jr. and Jason Baldwin, pleaded guilty and were sentenced to 18 years in prison with credit for time served, a prosecutor said. They were to be released on Friday. Critics of the prosecution argue no direct evidence tied the three to the murders and that a knife recovered from a lake near the home of one of the men could not have caused the boys' wounds. More recent DNA testing also demonstrated no links, according the mens' supporters. The case drew national attention, with actor Johnny Depp and singer Eddie Vedder and other celebrities, trying to rally support for the men's release. John Mark Byers, whose son Christopher Byers was one of the three victims, said he believes the three men are innocent. He said releasing them without exonerating them of the crime is an outrage. "They're innocent. They did not kill my son," Byers said before the hearing. But the father of another of the victims, Steven Branch, blasted the apparent agreement. "I don't know what kind of deal they worked up," Steve Branch told CNN affiliate WMC-TV. "Now you can get some movie stars and a little bit of money behind you and you can walk free for killing somebody." Echols was sentenced to death and Misskelley and Baldwin were given life sentences in the May 1993 slayings of Steven and fellow second-graders Michael Moore and Christopher Byers. The boys' bodies were mutilated and left in a ditch, hogtied with their own shoelaces. Prosecutors argued that the men convicted, teenagers at the time, were driven by satanic ritual and that Echols had been the ringleader. 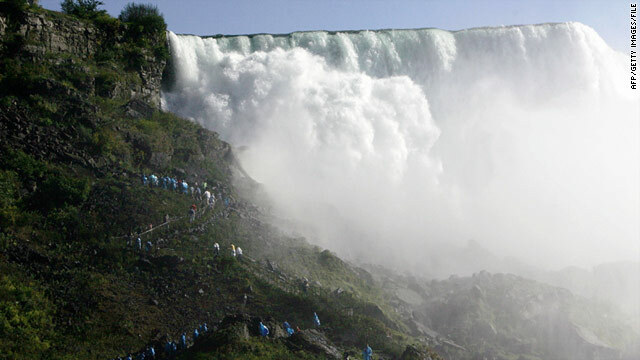 A 19-year-old Japanese woman was swept over Niagara Falls on Sunday. A body pulled from the Niagara River on Thursday has been identified as that of a Japanese student who fell into the river and was swept over the Horseshoe Falls on Sunday, local media report. "We have received information from the State Parks Police confirming that the found remains from yesterday are those of the missing student that fell into the river," Niagara Parks Police Chief Doug Kane is quoted as saying in the Niagara Falls Review. The identity was confirmed after an autopsy at the Erie County Medical Centre, according to the Review. A Florida babysitter was charged with child neglect after taking a baby in his stroller for a ride the bed of a pickup. According to 911 calls, several people contacted Daytona Beach police Wednesday when they saw the stroller in the back of the truck. 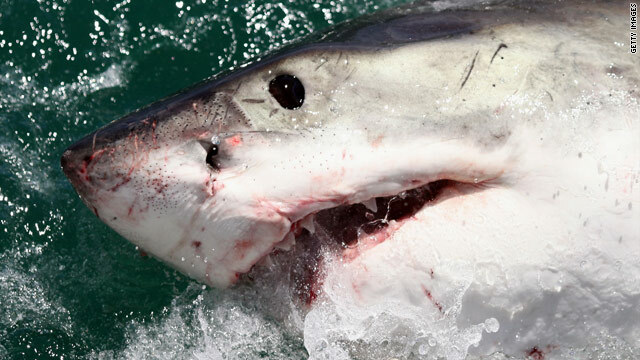 "It's not something you see every day," Daytona Beach police Chief Mike Chitwood told CNN affiliate WESH. "I hope they revoke her babysitting license for that. Would you want her watching your kid?" The babysitter, Keyona Davis, 23, said in a court appearance Thursday that she had a firm grip on the stroller and that she did not realize her actions constituted neglect. Davis' public defender had argued that the charge of child neglect was too harsh, as the baby was unharmed. "It's only if the pickup crashes, the child will be injured or hurt," a public defender said in court. Davis said she didn't realize that police would consider what she did as "negligent." "It's not like they give you a handbook or anything," she said. Davis was released from jail on her own recognizance. Police are still investigating the driver of the truck and the baby's mother. Filed under: Child safety • Crime • Florida • U.S. 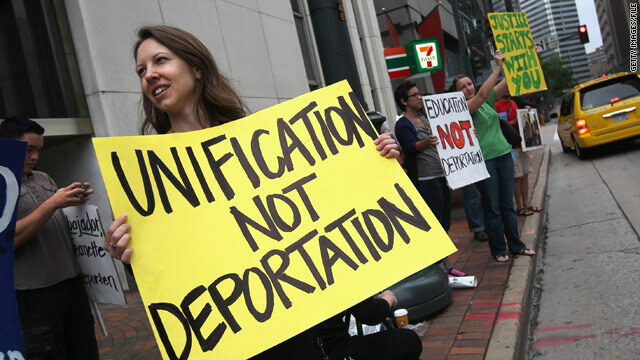 Supporters of an undocumented immigrant show support during a deportation court hearing in Denver, Colorado in July. Who does new immigration policy favor? The Department of Homeland Security is going to begin reviewing all 300,000 pending deportation cases in federal immigration courts to determine which individuals meet specific criteria for removal and to focus on "our highest priorities." So what does all this mean for illegal immigrants and what are the "highest priorities?" In a memo, director of U.S. Customs and Immigration Enforcement John Morton lays out what circumstances should be taken into account when it comes to prosecuting immigration cases. A day after the United States imposed stiff economic sanctions on Syria, European nations met Friday to consider their own stiff measures. But on the ground in Syria, security forces continued their tough offensive against protesters on Friday and reports have emerged of at least 17 deaths, despite the intensified world pressure for President Bashar al-Assad to halt the violence and step down. The European Union's political security committee was meeting in Brussels, Belgium to discuss options for toughening economic sanctions against Syria. 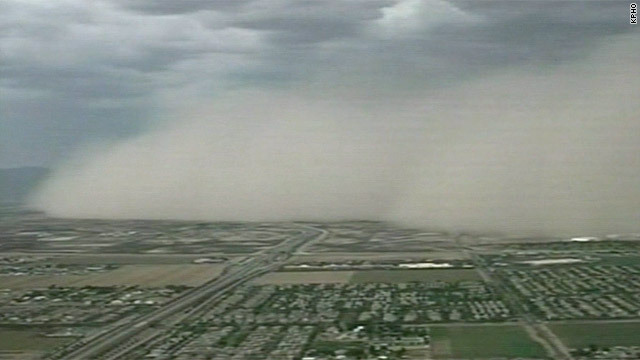 A huge wall of dust moves over the Phoenix area on Thursday. A massive dust storm rolled through Phoenix on Thursday, the third such storm to blanket its metropolitan area this summer. The cloud of dust was 50 to 60 miles wide and 3,000 to 4,000 feet high, National Weather Service meteorologist Dan Leins in Phoenix said. The dust reduced visibility to under a quarter-mile, was likely to blame for several traffic accidents and closed Sky Harbor International Airport for 40 minutes, according to a report in The Arizona Republic. More than 5,000 people lost electrical power at some point, and a few dozen structures and vehicles were damaged, the paper said. Leins said the massive dust cloud, also known by the Arabic term haboob, was driven by 40-mph to 50-mph winds spawned by severe thunderstorms that form to the southeast of the Valley of the Sun, where Phoenix sits. Indian activist Anna Hazare began a public hunger strike in the country's capital Friday, accompanied by thousands of cheering supporters. The 74-year-old campaigner, who is seeking stronger anti-corruption measures in India, was greeted by crowds as he left a jailhouse in New Delhi earlier to make his way to the city's large Ramlila Grounds. He will stage the two-week protest there after police relaxed their conditions. Supporters say he began fasting while still in jail. Hazare traveled from the jail in an open-top truck decorated with Indian flags, as thousands of citizens marched along. One of Europe's largest outdoor music festivals was canceled Friday after a stage collapsed during a violent storm in Belgium, killing five people and injuring 50 others, organizers said. Belgian authorities confirmed Friday that the death toll has gone up. "A fifth person has died," Andy Payne, spokesman for the nation's crisis center, told CNN. He said he did not know the circumstances surrounding the death. The storm struck Thursday just hours after Pukkelpop kicked off. The scheduled three-day event was in Hasselt, east of Brussels. Will Wall Street continue its unpredictable ride today? Watch CNN.com Live for the latest from the New York Stock Exchange. 9:20 am ET - Race to 2012: Perry in South Carolina - GOP presidential candidate Gov. Rick Perry tours Carolinas Hospital System in Florence, South Carolina, and makes remarks. Mounted police patrol in Kansas City, Missouri. Kansas City curfew: Kansas City, Missouri, is imposing a 9 p.m. curfew for those age 17 and younger in five areas of the city after violence last weekend in which three teens were wounded by gunfire in the city's Country Club Plaza entertainment district. Last Saturday's gunfire occurred just yards from the city's mayor, Sly James, who was making an appearance in the Plaza district to address problems of large groups of teens gathering in some of the city's entertainment and shopping areas, CNN affiliate KCTV reported. The new curfew, which the City Council passed Thursday night and the mayor is expected to sign Friday, will cover the city's downtown, Westport, Zona Rosa and 18th and Vine Historic Jazz District as well as Country Club Plaza, according to local media reports. It will be in effect through the last Sunday in September and will begin again the Friday before Memorial Day. Violators face fines of up to $500 and court costs, KCTV reported. 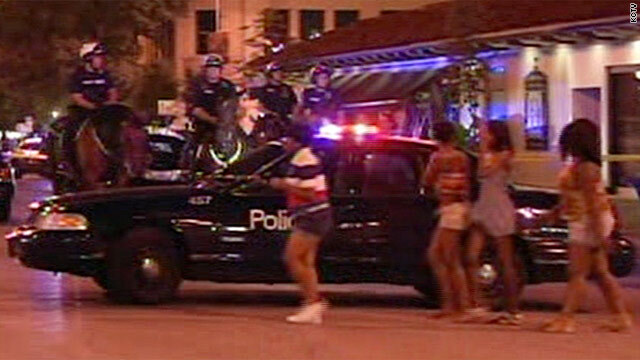 Kansas City is the second major city this month to impose earlier curfews in popular entertainment districts. Philadelphia, Pennsylvania, began earlier curfews last weekend in reaction to violence from mobs of teens. Norway massacre: The families of the victims of a mass shooting rampage on a Norwegian island are due to visit the scene Friday, a month after two attacks plunged the Scandinavian nation into mourning. Sixty-nine people died July 22 on Utoya island, where hundreds of mostly young people were gathered for a summer camp held by the youth wing of the governing Labour Party. Eight others died in the bombing of Oslo government buildings hours earlier. Anders Breivik, the man accused of carrying out both attacks, is expected to appear in court in Oslo on Friday. Police or prosecutors are expected to speak to reporters after his appearance, which will not be open to the public or media. Mortgage rates: The average interest rate on a 30-year fixed rate mortgage loan dipped to 4.15% this week, the lowest level recorded in 50 years, CNNMoney reports. The average rate beat the previous low of 4.17%, set last November, according to mortgage backer Freddie Mac's Primary Mortgage Market Survey. The average interest rate for a 15-year fixed rate loan was 3.36%, according to the report.